Custom Recovery ClockworkMod Running on Droid X! 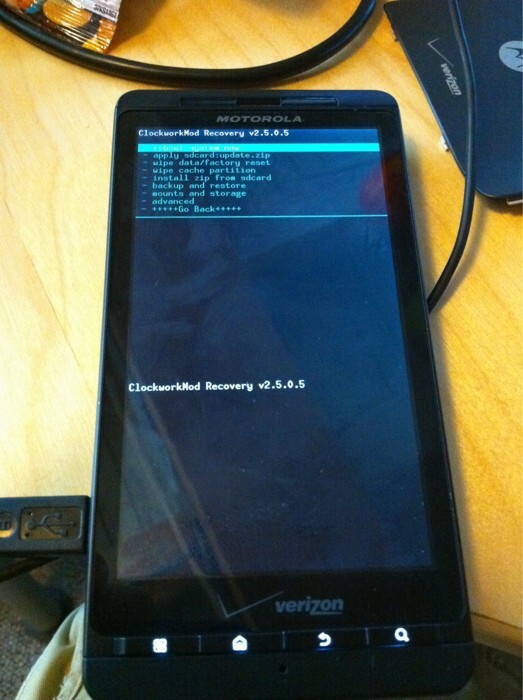 As you can see we’re getting closer and closer to our wonderful devs cracking the un-crackable bootloader on the Droid X. This picture was posted by Koush on twitter a few hours ago, and although he may have gotten a little ahead of himself when posting it, it’s still awesome to see this kind of progress already being made on this thing. Now just because ClockworkMod is “running” on the Droid X in the picture to the left, doesn’t mean we can just go and install a rom or anything for that matter yet. It just gets us one step closer to doing it. Realistically they won’t be able to “crack” the bootloader. I’d bet money on it. What I would guess is going to happen is someone will make a custom bootloader that will essentially loaded on top of the other one. Pretty much like a VM on a PC. Either way, kudos to Birdman, Koush and Alldroid.org for hitting this thing so aggressively. We’re all eagerly awaiting the payoff!